For patients with severe renal impairment, whilst effective chemotherapy can rapidly reduce FLC production, the half-life of the sFLCs will be prolonged and chemotherapy alone may not lead to an immediate reduction in sFLC concentrations. In such patients, it is tempting to think that strategies for direct removal of FLC will accelerate renal recovery. Indeed, a small study has shown that patients showing a 60% reduction in sFLC levels within 21 days of treatment have an increased chance of renal recovery . Plasma exchange, high-cut-off haemodialysis and adsorption have all been trialled as mechanisms for FLC removal; the results are discussed in detail below. Recent recommendations from the IMWG state that current data supports the use of HCO haemodialysis or plasma exchange (in combination with antimyeloma therapy) for selected patients with acute renal impairment due to MM cast nephropathy . Figure 27.5. Photomicrograph of pores in a Gambro high cut-off membrane and a high-flux membrane (Polyflux™). (Courtesy of M. Storr, Gambro Dialysatoren GmbH). Figure 27.6. Concentrations of λ FLCs in serum and dialysate fluid of a patient with due to LCMM undergoing dialysis with the Gambro high cut-off dialyser. The dialyser was renewed (arrows) as FLC leakage slowed. Figure 27.7. sFLCs in a patient presenting with MM and AKI who responded to haemodialysis with renal recovery. Pre- and post-dialysis concentrations are shown. Numbers indicate grams of FLCs removed (and hours of dialysis) per session. Dialysis was over 22 days leading to renal recovery that was maintained for over 2 years. Figure 27.8. sFLCs in a patient presenting with relapsing MM and renal failure who remained on dialysis because of inadequate chemotherapy, despite removing 1.7 kg of FLCs (shown per 10 day period). Figure 27.9. sFLC in a patient presenting with relapsing MM and AKI who recovered with chemotherapy and haemodialysis. Pre- and post-dialysis sFLC measurements are shown. The patient received dialysis over 20 days then had renal recovery with GFR rising to 50 ml/min/1.73m2. At 1 year the patient remained in complete MM remission. Dex: dexamethasone. Figure 27.10. (A) Reductions in sFLC concentrations at 5, 12, and 21 days. Results presented as patients who completed FLC removal HD with (clear boxes, n=6) and without (shaded boxes, n=13) a break in their chemotherapy. 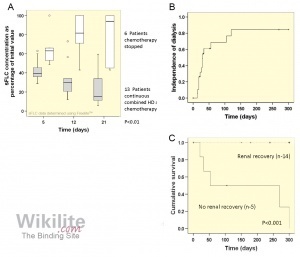 (B) Renal recovery rates of patients who received chemotherapy and FLC removal hemodialysis. 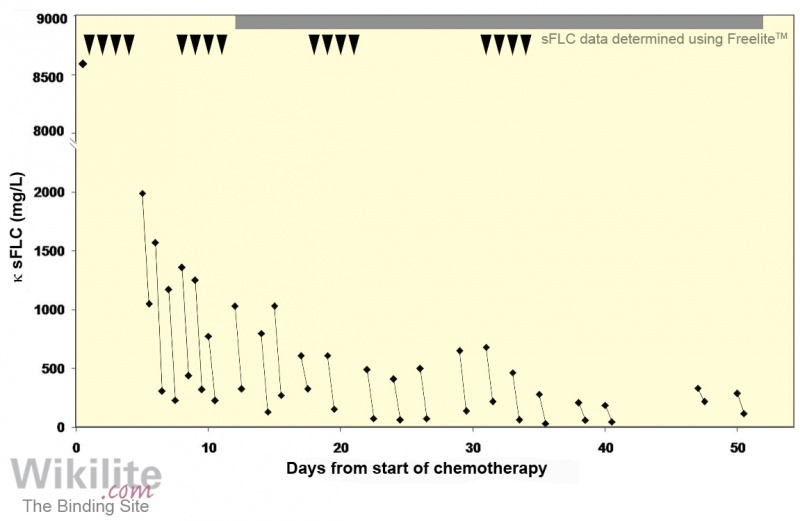 (C) Kaplan-Meier survival analysis of patients treated with chemotherapy and FLC removal HD. Patients who developed complications requiring early interruption of chemotherapy (solid line, n=6) had a significantly reduced survival compared with patients who received uninterrupted chemotherapy (broken line, n=13); p<0.001. (Republished with permission of Clinical Journal of the American Society of Nephrologypermission conveyed through Copyright Clearance Center, Inc.). Figure 27.11. Relationship of dialysis independence with sustained reduction in sFLCs. Percentage of patients achieving dialysis independence according to sFLC reduction at day 12, p<0.01. (Reproduced by permission of Oxford University Press). Figure 27.12. Renal biopsy of a patient with cast nephropathy. (A) At presentation and (B) 6 weeks after HCO haemodialysis, showing resolution of FLC casts in the distal tubules. (Courtesy of K. Basnayake). 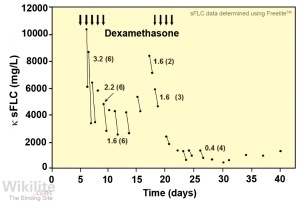 Figure 27.13. sFLC concentrations in a case of cast nephropathy treated with chemotherapy and HCO haemodialysis. Pre-dialysis and post-dialysis values are connected by lines. The concentration at the start of the first pulse of dexamethasone is also shown. The arrowheads represent daily doses of dexamethasone. Daily thalidomide is indicated by the solid line at the top of the chart. (Reproduced from with permission from the Journal of Medical Case Reports). As an alternative to plasma exchange, sFLCs can be removed more effectively by haemodialysis. Conventional high-flux dialysers have a molecular weight cut-off around 15 - 20 kDa so the filtration efficiency for FLCs is very low. However, a new generation of high cut-off (HCO) membranes have been designed to remove larger molecules (Figure 27.5) . With high permeability for substances in the molecular weight range of 15 – 45 kDa, such membranes can effectively clear both κ and λ FLCs. Initial data suggested that the duration of haemodialysis could be safely extended allowing further reductions in sFLCs. Hutchison et al. reported calculations from their mathematical model indicating that the prolonged daily use of HCO dialysers could rapidly reduce κ sFLC concentrations to less than 0.5 g/L in 2 - 3 days, equating to removal of around 95% of the total mass of sFLCs (Figure 27.3; Line 5). This preliminary publication also reported results from treating 5 newly-diagnosed MM patients with dialysis-dependent cast nephropathy . Figure 27.6 shows the rapid removal of λ FLCs in a patient with MM using the Gambro HCO 1100 dialysis membrane over a 6-hour period. Also shown are the large amounts of FLCs in the dialysate fluid. A total of nearly 40 grams of FLCs were removed in the single dialysis session. 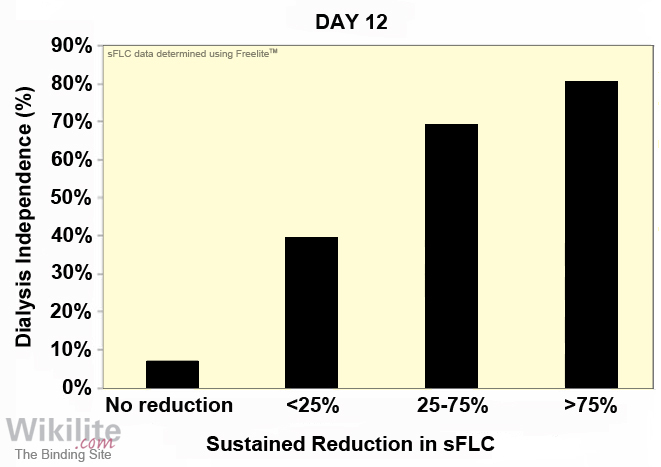 Sustained reductions in sFLC concentrations were observed in 3 patients who became independent of dialysis. Treatment examples are shown in Figure 27.7 and 27.8. The first of the figures shows good FLC reductions with recovery (Figure 27.7). In the second, the patient failed to achieve renal recovery (Figure 27.8). This patient developed sepsis and chemotherapy was stopped. Despite prolonged periods of haemodialysis and removal of 1.7 kg of FLCs, there was no recovery of renal function. It should be emphasised that for renal recovery to occur, patients needed both effective chemotherapy (to switch off FLC production) and rapid reduction of sFLCs. 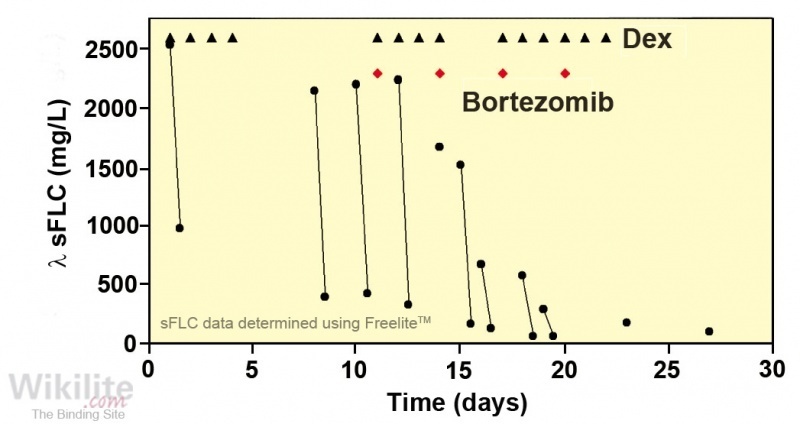 This is illustrated in Figure 27.9, in which a patient treated with HCO haemodialysis failed to respond to the initial chemotherapy but responded to bortezomib and subsequently recovered renal function. A subsequent publication by Hutchison et al. studied the effect of using two HCO 1100 dialysers in series, dialyser change, and haemodiafiltration on the efficiency of FLC removal. 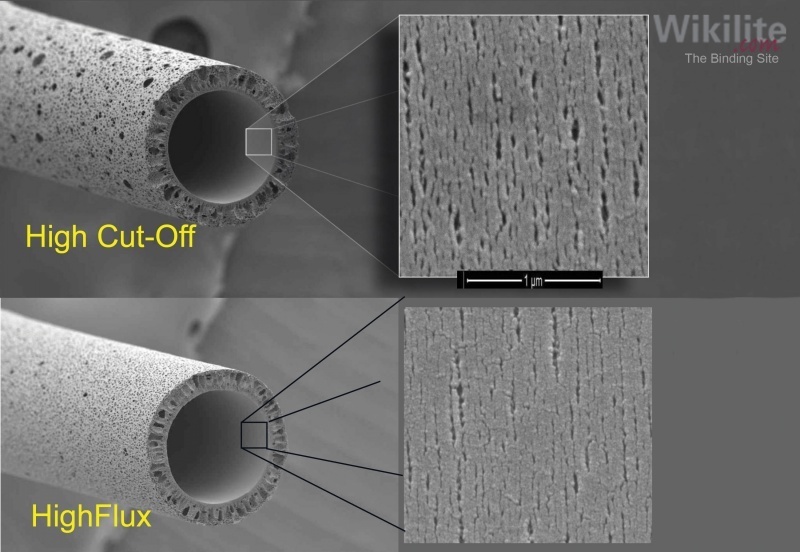 Based on the finding that the clearance rates of κ and λ FLCs increased when using two HCO 1100 dialysers in series, a new membrane, termed Theralite™, with a larger effective membrane area (2.1 m2) was developed. HCO haemodialysis was further evaluated by the same research group in a series of 19 patients with dialysis-dependent acute renal failure who were receiving a standardised dialysis protocol using two HCO 1100 in series with conventional chemotherapy . sFLC in a patient presenting with relapsing MM and AKI who recovered with chemotherapy and haemodialysis. Six patients had early infective complications, resulting in their chemotherapy being withheld. These patients did not achieve an early sFLC reduction, and only one subsequently became independent of dialysis (Figure 27.10A). 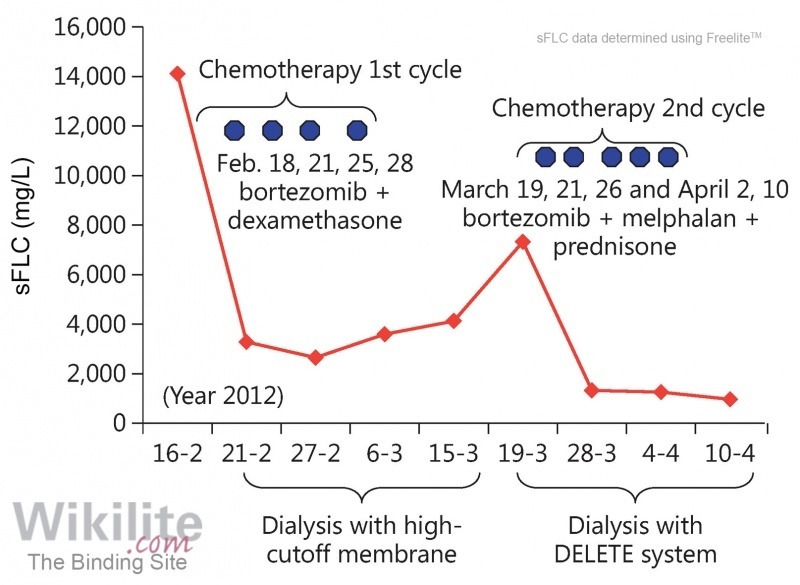 The remaining 13 patients had successful chemotherapy plus dialysis, and all had an early reduction in sFLCs (Figure 27.10A, shaded boxes) with subsequent renal recovery at a median of 27 days (Figure 27.10B). Patients who recovered renal function had a significantly improved survival (p<0.012; Figure 27.10C). An international, multi-centre, retrospective review of 67 patients with dialysis-dependent renal failure secondary to MM reported that 63% of patients became dialysis-independent following treatment with HCO haemodialysis and chemotherapy . The probability of achieving dialysis independence increased linearly with increasing levels of reduction in sFLC concentrations by day 12 (Figure 27.11). In a linear regression model, factors that predicted independence of dialysis were the degree of sFLC reduction at days 12 (p=0.002) and 21 (p=0.005) and the time from clinical presentation to the start of haemodialysis (p=0.006). In addition, patients treated in experienced centres (>3 patients) were more likely to become dialysis-independent. 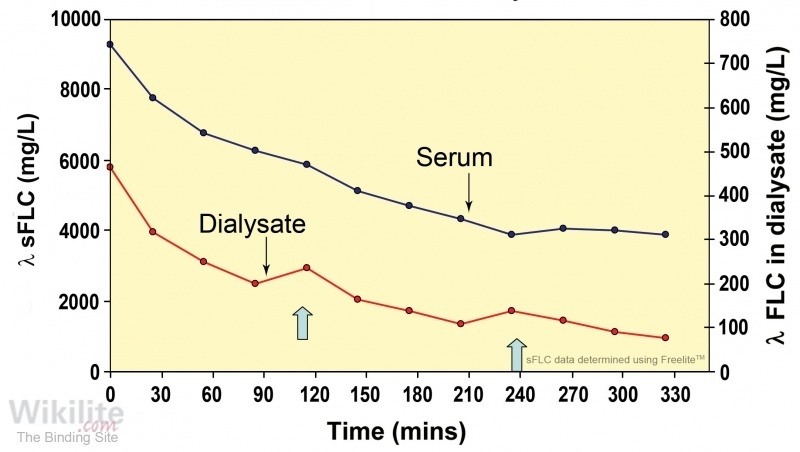 Analysis of treatment practices revealed that such centres had a shorter delay between the presentation with renal failure and the initiation of dialysis. Results from HCO haemodialysis trials have also been reported by other research groups. Khalafallah et al. reported a series of four patients treated in Tasmania; the three de novo MM patients recovered renal function whilst the patient with relapsed disease did not. Five patients treated in Spain were the subject of a publication by Borrego-Hinojosa et al. . Four of the five became dialysis independent and from consideration of their results the authors suggested that early initiation of treatment could be a determining factor for the response. Tan et al. reported a case series of six patients treated in New Zealand, of whom only three became dialysis independent and the authors concluded that the benefit of HCO dialysis was unproven. Haemodialysis may not be effective if the patients’ plasma contains monoclonal FLCs that form large aggregates (Section 7.6). Harding et al. described two patients with renal failure and MM for whom HCO haemodialysis was not effective in removing monoclonal sFLCs. Size exclusion chromatography demonstrated that a significant proportion of the tumour-produced sFLCs were in the form of large polymers. Such aggregates were too large to pass through the dialysis membrane. Two large multicentre, prospective, randomised controlled trials, EuLITE and MYRE have been undertaken to determine whether HCO haemodialysis improves patient outcomes . Cook et al. reported the findings of the EuLITE study, which compared HCO haemodialysis to standard high-flux haemodialysis in 90 patients with newly diagnosed MM and associated cast nephropathy, treated with bortezomib-based chempotherapy. At randomisation there was no difference in the sFLC levels between the HCO and high-flux groups. Following the first full protocol dialysis, a greater reduction in sFLC concentrations was observed for the HCO compared to the high-flux protocols (κ patients 75.6% vs 20.2%; λ patients: 71.2% vs 9.1%, p<0.001). However, after 3 weeks of treatment there was no difference in the reduction of sFLCs between the two groups, nor in the overall proportion of patients with renal recovery (HCO: 58.1%; high-flux: 66.0%). Unfortunately, HCO haemodialysis was associated with increased lung infections in the first 3 months (p=0.014) and a reduced overall survival at 2 years (55.8% and 76.6%, respectively). In summary, the EuLITE HCO protocol did not result in an improved outcome compared to standard high-flux dialysis, and the results of the MYRE study are now awaited. Resolution of cast nephropathy following FLC removal by haemodialysis . A 61-year old Caucasian woman, having previously been fit and well, presented to her general practitioner complaining of feeling tired and weak. Initial investigations showed AKI, with a serum creatinine of 872 μmol/L (reference range: 60 - 110 μmmol/L), serum urea of 31.5 mmol/L (reference range: 2.5 - 7.8 mmol/L) and haemoglobin 7.8 g/dL (reference range: 12.0 - 16.0 g/dL). Urine output was approximately 2 liters/day. Serum immunofixation electrophoresis (sIFE) identified a monoclonal κ FLC band, which was confirmed by sFLC analysis: κ sFLC 15,700 mg/L (reference range: 3.3 - 19.4 mg/L); λ sFLC 22.4 mg/L (reference range: 5.7 - 26.3 mg/L) and κ/λ sFLC ratio 701 (reference range: 0.26 - 1.65). A skeletal survey identified lytic lesions and a bone marrow examination showed 90% plasma cell infiltration. A renal biopsy confirmed a diagnosis of MM cast nephropathy. Casts affected approximately 30% of the distal tubules and collecting ducts with moderate diffuse interstitial fibrosis and tubular atrophy Figure 27.12A. The patient was initially treated with intravenous rehydration over 4 weeks, during which time a 40% reduction in sFLCs was observed, although renal function remained severely impaired (eGFR <10 ml/min/1.73 m2). 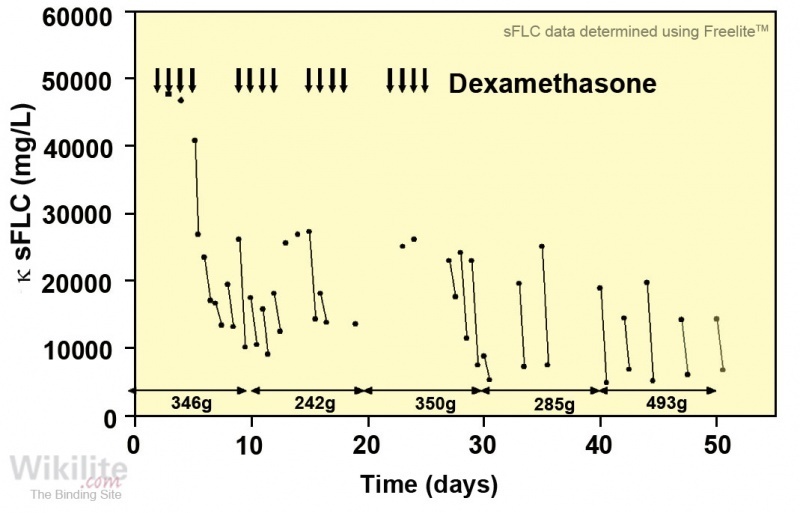 Chemotherapy was commenced with high-dose dexamethasone and thalidomide, and κ sFLC concentrations were reduced to 1990 mg/L within 5 days of initiating the first cycle. Haemodialysis was initiated with two HCO 1100 dialysers in series for 3 hours, then for 6 - 8 hours daily for 5 days, 8 hours on alternate days for the next 7 days, and then 4 - 6 hours 3 times per week. After 16 haemodialysis sessions, κ sFLC concentrations had fallen to <500 mg/L and were subsequently maintained below this level Figure 27.13 . Despite this, the patient remained dialysis-dependent and a repeat renal biopsy was performed. The biopsy demonstrated resolution of waxy casts and partial resolution of the inflammatory infiltrate, but interstitial fibrosis and tubular atrophy was unchanged Figure 27.12B . After a further six dialysis sessions the patient was switched to a standard high-flux schedule. After a further 5 days the haemodialysis was discontinued in accordance with the patient’s wishes. Creatinine was 650 μm/L. One year on, the patient remains clinically well, with a maintained urine output and no uraemic symptoms despite having an eGFR of 8 ml/min/1.73 m2. The patient’s MM remains in remission. 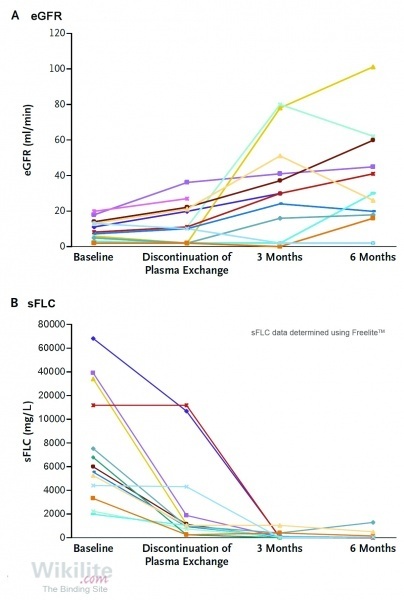 In summary, this case illustrates how the sFLC assay can effectively monitor reductions in FLCs following treatment with chemotherapy and HCO haemodialysis. It also provides histological evidence that such reductions may be accompanied by resolution of intratubular casts. Figure 27.14. sFLC concentrations in a 77-year-old woman with MM treated with chemotherapy and dialysis. Dialysis was initially performed with HCO dialysers, and subsequently with a PMMA double-filter circuit. (Copyright © 2013 Karger Publishers, Basel, Switzerland). As an alternative to removal of sFLCs by HCO haemodialysis, strategies have been proposed that employ FLC adsorption or a combination of haemodialysis and adsorption. Polymethylmethacrylate (PMMA) membranes are routinely used to perform standard haemodialysis, but until recently their adsorption capacity for FLCs had not been well characterised. Fabbrini et al. treated 10 patients with dialysis-dependent renal failure and high levels of monoclonal sFLCs (>500 mg/L) with at least one standard 4-hour dialysis session with a Toray BK 2.1 m2 PMMA membrane. The study concluded that PMMA haemodialysis reduced κ and λ sFLCs to a similar extent (concentrations were reduced by 22.3% and 21.0%, respectively), but that the process was limited by membrane saturation. Dialyser replacement after 2 hours (termed “enhanced adsorption dialysis”) increased the overall adsorption efficiency, particularly for λ FLCs . Santoro et al. reported similar findings using two PMMA membranes in sequence (termed the “DELETE system”). An illustrative case is shown in Figure 27.14 . A different strategy for FLC removal employed a plasma filter followed by a sorbent cartridge. This technique, known as coupled plasma-filtration adsorption (CPFA), has been used in the extracorporeal treatment of sepsis. In an in vitro study of FLC removal by CPFA using a number of different resins, the MDR3 resin demonstrated the best adsorptive capacity . For patients treated with at least six, 4-hour CPFA sessions using MDR3, sFLC concentrations progressively decreased (p=0.05), although the dialysis protocol remains to be optimised. 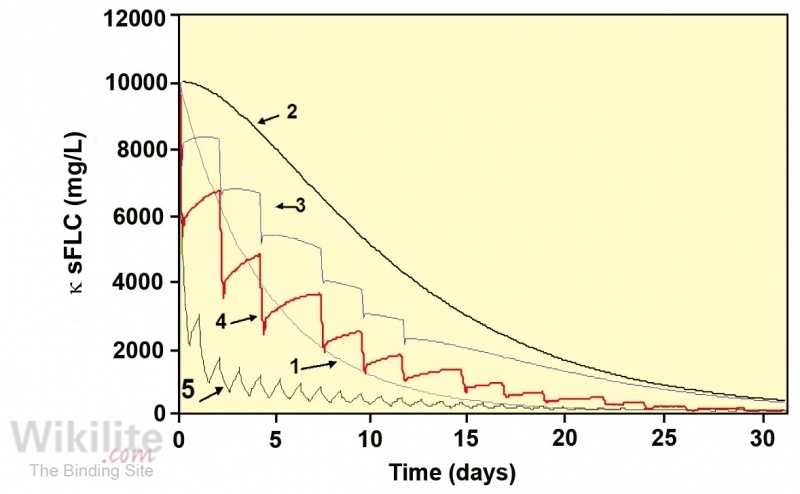 Another adsorption strategy has used “SUPRA HFR”, a form of haemodiafiltration with separated convection, diffusion and adsorption stages that avoids the albumin losses seen with other HCO haemodialysis protocols. The filter comprised an HCO membrane (Synclear 0.2), followed by a low-flux polyphenylene membrane in a second diffusive stage, and a sorbent cartridge with a high affinity for FLCs. Three patients with dialysis-dependent renal failure due to biopsy-proven cast nephropathy were successfully treated with SUPRA HFR . All patients showed a significant reduction of sFLCs and a complete recovery of renal function after 30, 50 and 90 days, respectively . Pasquali et al. reported four further patients treated with this protocol, of whom three recovered renal function. 25. Pasquali S, Iannuzzella F, Corradini M, Mattei S, Bovino A, Stefani A et al. A novel option for reducing free light chains in myeloma kidney: Supra-hemodiafiltration with endogenous reinfusion (HFR). J Nephrol 2014;28:251-4.